Kronomyth 2.0: The Mahavishnu Lifetime Express. After hearing Extrapolation, you would logically extrapolate another album of jazz/rock fusion, not forty minutes of electric guitar flailing on a bed of organ, bass and drums. The front cover wasn’t false advertising despite the appearance of an acoustic guitar that almost certainly stayed in its case during these sessions: this is some lurid, distorted, tripped-out music that suggests Hendrix and Frank Zappa and even a little King Crimson rolled into one smokeable wonder. At least, that was my initial impresson upon hearing “Devotion.” Unfortunately, further listenings never bred a deeper fondness for it. It’s shocking, yes, but unfinished, and I’m sure there are tapes in the Jimi Hendrix Archives with as much (or more) to offer. Although I wouldn’t call this fusion music, structurally the songs are informed by jazz. The opening lines from “Devotion,” for example, remind me of John Coltrane’s mathematical progressions, if on a more modest scale. The effect is uncomfortable and intense, equal parts arched progressive cathedral of King Crimson and chaotic anti-church of Deep Purple. It’s strange to think that Frank Zappa and John McLaughlin, two very different people, would arrive at the same musical place, but the similarities are unshakable. Billy Rich plucks one resonating note, Miles and Young add to the churning drone, and JM gleefully tears loose on two channels. The effect is like having Hendrix in your left ear and Zappa in your right ear. “Devotion” is the session’s primary statement; everything that follows more or less stems from the musical ideas advanced here. In case you’re still waiting for jazz/fusion music, “Dragon Song” makes plain that it isn’t coming. This is some of the heaviest rock music from JM that I’ve ever heard. Zappa is again the operative reference point for me (and the small rock I live under), although I’d concede JM the upper hand in terms of articulated speed. Billy Rich continues to hammer along on the same few notes, and you begin to get the sense that this session is just a showcase for epic electric guitar riffage. The second side features shorter compositions that feel like excerpts from jam sessions. “Marbles” introduces a cool bass riff that mutates in the opening moments, with the electric guitar bubbling through the surface in short, furious bursts. The jammy “Siren” shows Rich and Young mixing it up with some funky interplay. “Don’t Let The Dragon Eat Your Mother” is as spaced-out as it sounds, with wailing guitar reminiscent of Hendrix. The last track on the album, “Purpose of When,” is one of my favorite tracks on here because of the bell-like sound that Larry Young achieves on his organ, which immediately reminded me of Ruth Underwood. All four players seem to be on their own trip this time, but arrive at an interesting mix of sounds. JM brings string-bending, mind-crushing distortion to an impressive conclusion. 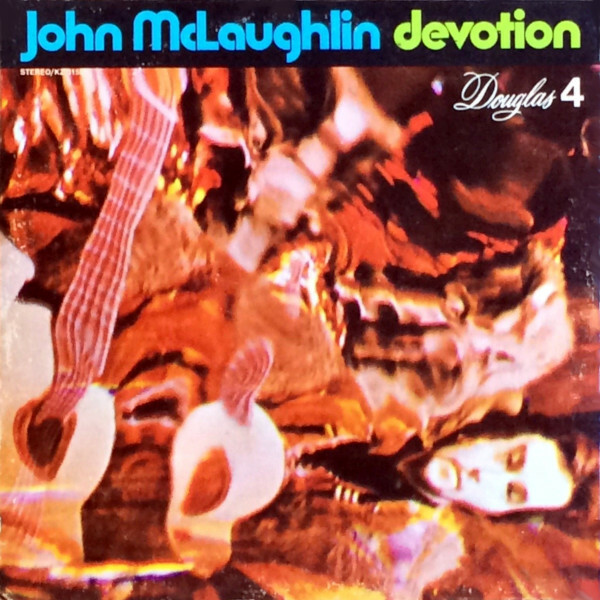 Devotion is a definite departure for John McLaughlin into the realms of psychedelic/progressive rock. It is not, however, a work of calculated art like Burnt Weeny Sandwich, but rather an ad hoc adventure into the sonic frontier. Hearing McLaughlin throw his metaphorical hat into the ring with Jimi Hendrix, Frank Zappa, Carlos Santana and Robert Fripp is interesting in a “you really should hear this” sort of way, not in a “you’ll want to hear this all the time” way. Furthermore, the backing band of Young, Miles and Rich is underutilized. It’s unlikely the Buddy Miles Express mailed it in, as Rich and Miles do here, and Larry Young had a lot more to say on the previous Lifetime effort, Emergency!, which was even more experimental than this session, if less concrete. McLaughlin devotees might shell out $15 for a clean version of this on elpee or the re-sequenced compact disc. I have no idea why the reissuers switched the track order, unless they felt that “Devotion” made for a better ending than beginning. As for a proper beginning to collecting McLaughlin, I’d start with the first Mahavishnu disc, The Inner Mounting Flame. Then again, as with the jazzier Extrapolation, I’m sure there is no shortage of wanky guitar aficionados who will tell you that Devotion is a work of genius. JM is a genius, and Devotion is his work, but making any connection past that is pure fantasy. This session is simply another interesting stop in a whirlwind creative period, tantalizing for its connection to Jimi Hendrix, but no more a work of art than what lies in Hendrix’ own unreleased archives. All selections composed by John McLaughlin. John McLaughlin (guitar), Buddy Miles (drums, percussion), Billy Rich (bass), Larry Young (organ, electric piano) with Ralph MacDonald (percussion & conga on B3). Produced by Stefan Bright and Alan Douglas; remix engineered by Tony Bongiovi. Cover and inside photography by Ira Cohen. Liner photographs by Michael Margetts. Released on elpee in September 1970 in the US (Douglas, Douglas 4) with gatefold cover. Re-issued on elpee in 1972 in the US (Douglas, KZ 31568) with gatefold cover. Re-issued on elpee and compact disc in 1984 in the Netherlands (Celluloid, CELL/CELD 5010) with unique cover with different track order: B1/B2/B3/B4/A2/A1. Re-released on remastered compact disc in 2001 in the US (Fuel 2000, 3020611332). Re-released on 180g vinyl elpee in 2016 in Europe (Vinyl Passion, VP 80082) with unique cover.